In November 2014, the Campofrio Food Group holding factory in Burgos, Spain caught fire. The factory employed over 1,000 locals and was regarded as the principle employer in Burgos. 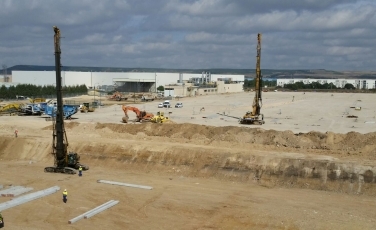 Thanks to the EU and Spanish government funding, the rebuild of the new factory began in September 2015 with the aid of construction giant, Terratest S.A. The work has taken place in multiple stages to ensure the smooth running of the project. Terratest utilised two driving rigs mounted on a crawler track IMT-220 with a hammer Junttan 9 to drive 750 precast piles between 6 m and 24 m deep. Piles which exceeded 12 m were connected with ABB joints class A. The structural top of these piles had a projected double pile cap and a separation of shaft pillar between 1.10 m to 1.20 m, to absorb their service loads. With a predicted end date of January 2016, fluid communication within the team is paramount to the success and overall timescale of the project. The final project cost is likely to be in the region of €215,000,000. The new factory launch hopes to reemploy many of the original Campofrio work force and reinvigorate employment levels in Burgos.